though we could not get all seven races in. This year I made some new friends. friend of many years. I think that Dan Socha was looking over Mark’s shoulder. 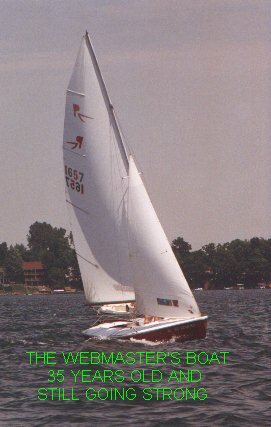 the 1998 series was shortened because of too little wind. could crew for my brother Chris in our boat appropriately named "Flower Power"
looked in my archives and found the entire program for the 1969 entertainment. Tom Ehman – for his rapport with all Protest Committee and his ":up, up, up"
I have heard that the first time we had live entertainment was in 1966. Marvin Brinn should hold the permanent title of entertainment director. I running back and forth along the shore looking for our dad and uncle. Herndons, the Ehmans, the Mahans, the Pattons and all the rest. that term loosely). I think the pool was 30 proof by the time we vacated! Colthorps, Hunsakers, Bartlettes, Krajewskis, Ehmans Musselmans and many more. middle of the channel on Tuesday night..
with good friends and family. Hope to see all of you next year at Clark’s Lake.